Learning to enjoy food and still maintain good health, and your desired weight, is so important and IS possible! NOW is the time to commit to a healthy nutrition plan! Keeping your nutrition simple is the key to success! If you want to learn the "HOW TO GUIDE" to keeping it simple, shoot me an email through our contact page and I'll let you know when the next Free Nutrition webinar is scheduled. Hydration is a great place to start and you must get enough water! A good rule of thumb is to divide your weight in half and that is how many ounces of water one should drink a day. (Typically, one does not want to exceed 100 oz a day). Drink water when you get up in the morning. Drink water before meals and sip water during meals. Coffee and tea may be consumed in moderation. Pop cannot be recommended due to the amount of sugar in them! Get your rest! Sleep seven to nine hours each evening. Two hours of sleep before midnight is worth four hours of sleep after midnight. Go to bed. Early to bed, early to rise! Remember, diets don’t work, good habits do! 7. At every meal eat some type of carbs, protein, and fat. This is what we call meal-combining. 8. Shop along the walls of your grocery store! This is where the real food is located. Jump in the aisle to get coffee, tea, canned meat, natural peanut butter, whole grain bread, toiletries and jump out! 9. DRINK A LOT OF WATER!! Half your body weight in ounces/day. 10. PLAN IT! If you fail to plan you are planning to fail! Combine carbohydrates, protein, and fat each time you eat. This is a key to a healthy eating lifestyle! Sit down and write out what you will cook for dinner for the next seven days and post it to your refrigerator so you'll remember during the week. Then write your grocery list according to those seven meals. Write it in the order you will walk through your store. There you go! You have 7 healthy things to cook. Don't pick hard things. Keep it simple. Protein on the grill, baked veggies and steam some rice or sweet potato in the microwave. Dinner is done! What questions do you have? Shoot me a question here . I want to help and it will also help me help others! "Let food be thy medicine and medicine they food"
"Remember: Diet's don't work, good HABITS do!" Did you know people often think if they eat a healthy diet they do not need to supplement?? Statistically though only 2% of Americans get the recommended amount of fruits and vegetables in their diet. And even when we strive to eat a lot of fruits and vegetables our crops have a 38% decline in the nutrient value of produce (plus don't forget all the potential toxins from the environment). Poor nutritional habits are becoming a national epidemic. 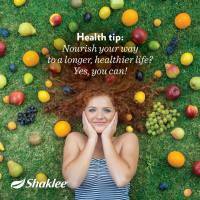 Shaklee has several regimens to take care of this problem and fill in nutritional gaps. Yes, you still need to eat healthy, but getting on a good supplementation regimen will build healthier cells, therefore creating a heatlhier life! I trust Shaklee and have used the products now since 2009. I love that there are never any artificial colors, sweeteners or preservatives in their products! Read more of my story here . And see more of why I trust Shaklee . Remember that our bodies are forming new cells every 120 days. Your cells are made up of vitamins, minerals & protein. Therefore, you must be giving your body the nutrition it needs to build healthy cells. And you need to take Shaklee nutritional supplements faithfully (aim for 120 days straight) to build a new immune system and change the future of your health forever. I believe that if you start today, you will feel better in 30 days. And the great news is, Shaklee has a 100% money back guarantee! Join FREE with by clicking on Join as Member and then choose one of these Shaklee Health Plans. You will get a FREE life-time membership and enjoy a 15% savings from now on! Shaklee has a place to start for any budget. Our multi-vitamin, Vitalea, is only $23 for a two month supply! Get started today! Shoot me an email and let me tailor a program right for your health needs and your budget. Contact me now! YES! Countless studies now confirm that supplementation has huge benefits to health. 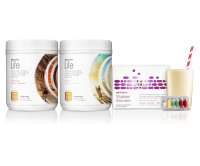 Shaklee is the only company with a long-tem study that shows proof of the products! Even if you eat healthy, supplementation has a place! Shaklee has been around for 60 years! Dr Shaklee invented the first multi-vitamin! I took Vitalizer for 6 years without missing a day! I credit this product to building a STRONG immune system! I now take the Life Strips.